in Europe, Erich Hartmann took off for one final mission. Over the city of Brno in Czechoslovakia, he spotted a pair of enemy Yak-9s performing impromptu aerobatics for Soviet troops on the ground. Hartmann, however, upstaged the show and promptly shot one of them down! It was his 352nd aerial victory, a total never likely to be surpassed. To achieve such feats his tactics were simple – ‘Get in so close and you cannot miss’. Words easily said, but doing so required extreme courage and exceptional flying skills, qualities that Hartmann possessed in abundance. During some 1400 combat missions in the hazardous skies over the Eastern Front he was never shot down through enemy action yet still survived 14 crash-landings, many were the result of damage from the flying debris of his victims. Flying Bf109s for his entire career, almost exclusively with JG52, Erich Hartmann never lost a wingman and, awarded the Knight’s Cross with Oak Leaves, Swords and Diamonds, became one of the Luftwaffe’s most highly decorated Aces. It is said that his reputation and the sight of his all-too-familiar Messerschmitt, nose adorned with his distinctive ‘Black Tulip’ markings, was enough to make many an enemy pilot take to their heels. Most, however, never got a chance to escape. 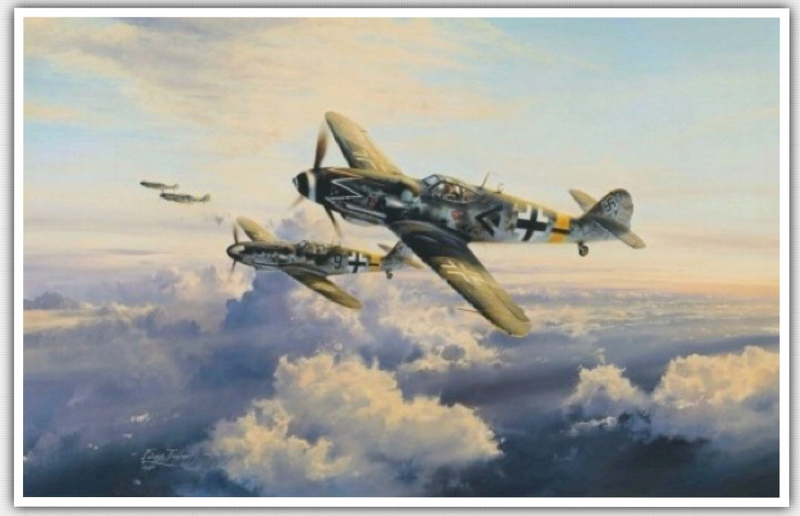 One of Robert Taylor’s most iconic paintings - Ace of Aces features Hartmann leading a Schwarm of Bf109s from JG52 as they begin their attack. Originally published in 1988, many aviation art collectors will have never seen this stunning image.